, a learned critic and astronomer, was born at Perry St. Paul, commonly called Pauler’s Perry, near Towcester in Northamptonshire, the 2d of May 1638. He received some part of his education at Northampton but his father dying when he was very young, his mother sent him to an uncle in London, who entered him at Merchant-taylors-school, in 1648 here he continued tillJune 1655, when he was elected scholar of St. John’s college in Oxford, of which also he became afterwards fellow. DuTing his stay at school, he had accumulated an uncommon fund of classical learning, so that when he went to the university, he was a great master of the Greek and Latin tongues, and not unacquainted with the Hebrew. He had also previously acquired a good Latin style, could compose | verses well, and often used to divert himself with writing epigrams, but he quitted these juvenile employments when at the university, and applied himself to history, philology, and philosophy, and made himself master of the Hebrew, Syriac, Arabic, and Coptic. He applied himself next to the mathematics, under the famous Dr. J. Wallis. He took the degree of B. A. Feb. the 12th, 1659 that of master, April 16, 1662 and that of B. D. June 9, 1668. Decem,ber following he went to Leyden, to consult several Oriental manuscripts left to that university by Joseph Scaliger and Levinus Warner, and especially the 5th, 6th, and 7th books of Apollonius Pergieus’s conic sections; the Greek text of which is lost, but which are preserved in the Arabic version of that author. This version had been brought from the East by James Golius, and was in the possession of his executor, who, pleased that Mr. Bernard’s chief design in coming to Holland was to examine this manuscript, allowed him the free use of it. He accordingly transcribed these three books, with the diagrams, intending to publish them at Oxford, with a Latin version, and proper commentaries; but was prevented from completing this design. 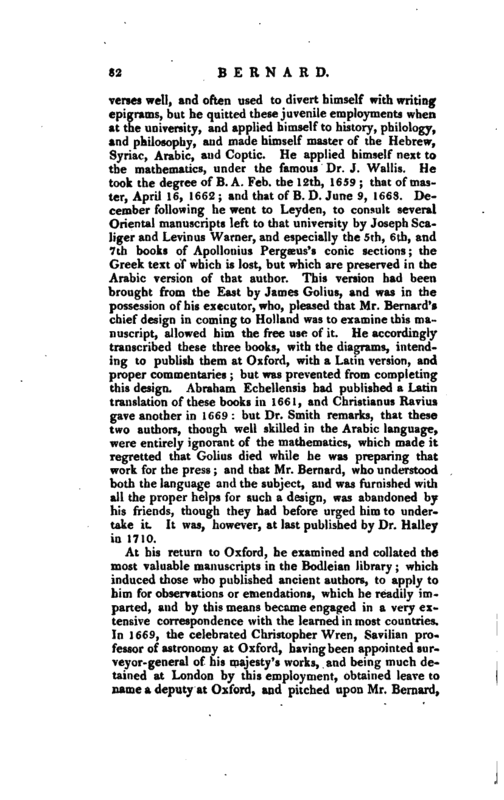 Abraham Echellensis had published a Latin translation of these books in 1661, and Christianus Ravius gave another in 1669: but Dr. Smith remarks, that these two authors, though well skilled in the Arabic language, were entirely ignorant of the mathematics, which made it regretted that Golius died while he was preparing that work for the press; and that Mr. Bernard, who understood both the language and the subject, and was furnished with all the proper helps for such a design, was abandoned by his friends, though they had before urged him to. undertake it. It was, however, at last published by Dr. Halley in 1710. 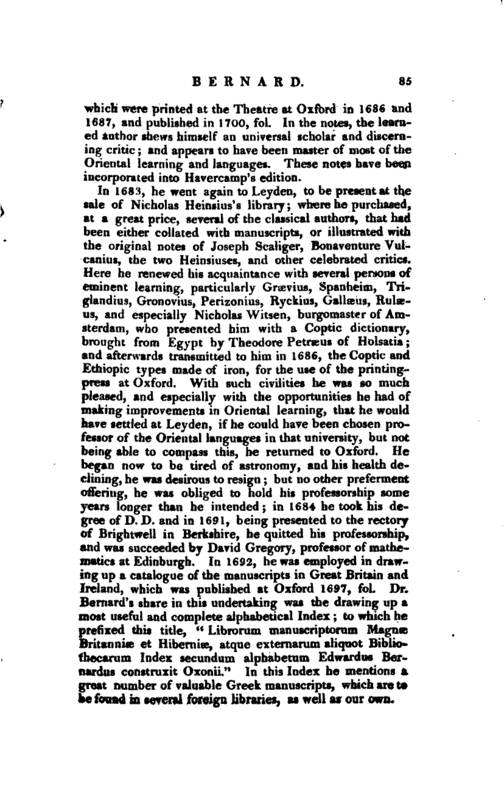 At his return to Oxford, he examined and collated the most valuable manuscripts in the Bodleian library; which induced those who published ancient authors, to apply to him for observations or emendations, which he readily imparted, and by this means became engaged in a very extensive correspondence with the learned in most countries. In 1669, the celebrated Christopher Wren, Savilian professor of astronomy at Oxford, having been appointed surveyor-general of his majesty’s works, and being much detained at London by this employment, obtained leave to name a deputy at Oxford, and pitched upon Mr. Bernard, | which obliged the latter to confine his application more particularly to the study of astronomy. In 1672, the master and fellows of his college presented him to the rectory of Cheame in Surrey and February following, Dr. Peter Mews, the master, being advanced to the bishopric of Bath, and Wells, appointed Mr. Bernard one of his chaplains. But the following year he quitted all views of preferment, by accepting the Savilian professorship of astronomy, vacant by the resignation of sir Christopher Wren for, by the statutes of the founder, sir Henry Savile, the professors are not allowed to hold any other office either ecclesiastical or civil. 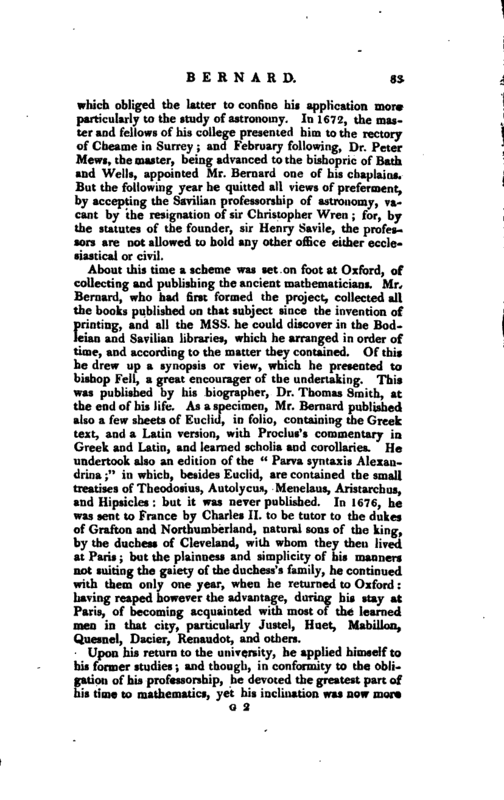 About this time a scheme was set on foot at Oxford, of collecting and publishing the ancient mathematicians. 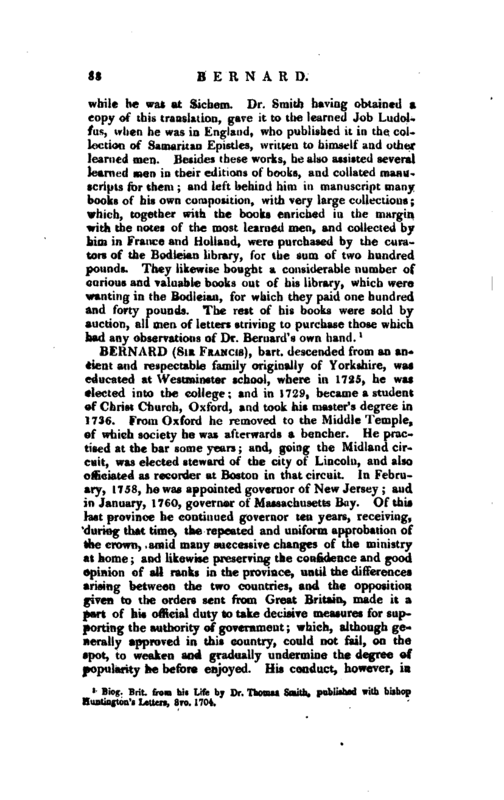 Mr. Bernard, who had first formed the project, collected all the books published on that subject since the invention of printing, and all the Mss. he could discover in the Bodleian and Savilian libraries, which he arranged in order of time, and according to the matter they contained. Of this he drew up a synopsis or view, which he presented to bishop Fell, a great encourager of the undertaking. 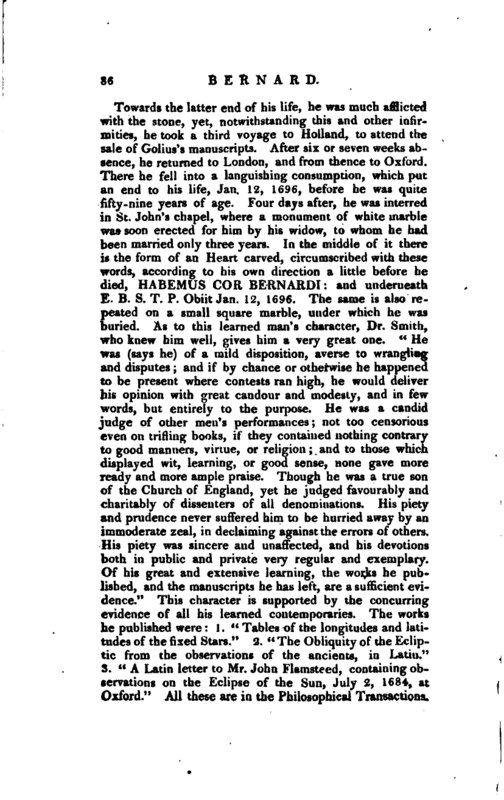 This was published by his biographer, Dr. Thomas Smith, at the end of his life. 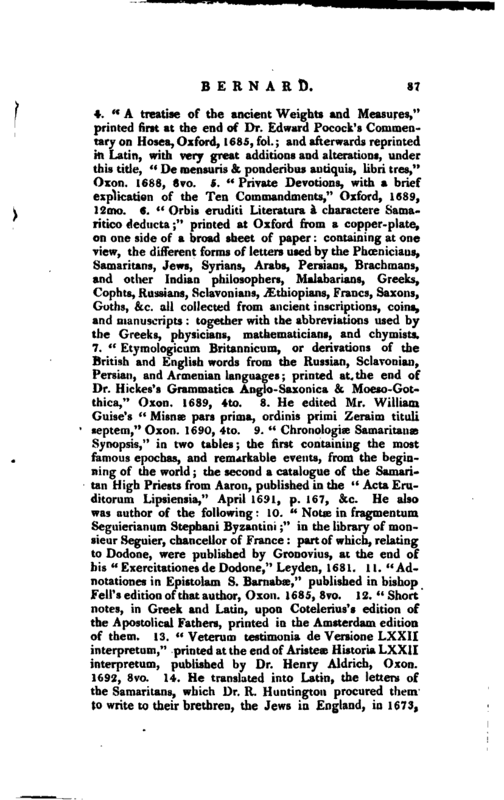 As a specimen, Mr. Bernard published also a few sheets of Euclid, in folio, containing the Greek text, and a Latin version, with Proclus’s commentary in Greek and Latin, and learned scholia and corollaries. He undertook also an edition of the “Parva syntaxis Alexandrina” in which, besides Euclid, are contained the small treatises of Theodosius, Autolycus, Menelaus, Aristarchus, and Hipsicles but it was never published. In 1676, he was sent to France by Charles II. to be tutor to the dukes of Grafton and Northumberland, natural sons of the king, by the duchess of Cleveland, with whom they then lived at Paris; but the plainness and simplicity of his manners not suiting the gaiety of the duchess’s family, he continued with them only one year, when he returned to Oxford having reaped however the advantage, during his stay at Paris, of becoming acquainted with most of the learned men in that city, particularly Justel, Huet, Mabillon, Quesnel, Dacier, Renaudot, and others. Upon his return to the university, he applied himself to his former studies and though, in conformity to the obligation of his professorship, he devoted the greatest part of his time to mathematics, yet his inclination was now more | to history, chronology, and antiquities. He undertook a new edition of Josephus, but it was never completed. The history of this undertaking is somewhat curious. Several years before, bishop Fell had resolved, with our author’s assistance, to print at the theatre at Oxford a new edition of Josephus, more correct than any of the former. But, either for want of proper means to complete that work, or in expectation of one promised by the learned Andrew Bosius, this design was laid aside. Upon the death of Bosius, it was resumed again and Mr. Bernard collected all the manuscripts he could procure out of the libraries of Great Britain, both of the Greek text and Epiphanius’s Latin translation, and purchased Bosius’s valuable papers of his executors at a great price. Then he published a specimen of his edition of Josephus, and wrote great numbers of letters to his learned friends in France, Holland, Germany, and other countries, to desire their assistance in that work. He laboured in it a good while with the utmost vigour and resolution, though his constitution was much broken by intense application. But this noble undertaking was left unfinished, for these two reasons. First, many persons complained of Epiphanius’s translation, because it was defective, and not answerable to the original in many places, and required a new version, or at least to have that of Gelenins revised and corrected. Secondly, objections were made to the heap of various readings that were to be introduced in this edition, and with the length of the commentaries, in which whole dissertations were inserted without any apparent necessity, that ought to have been placed at the end of the work, or printed by themselves. 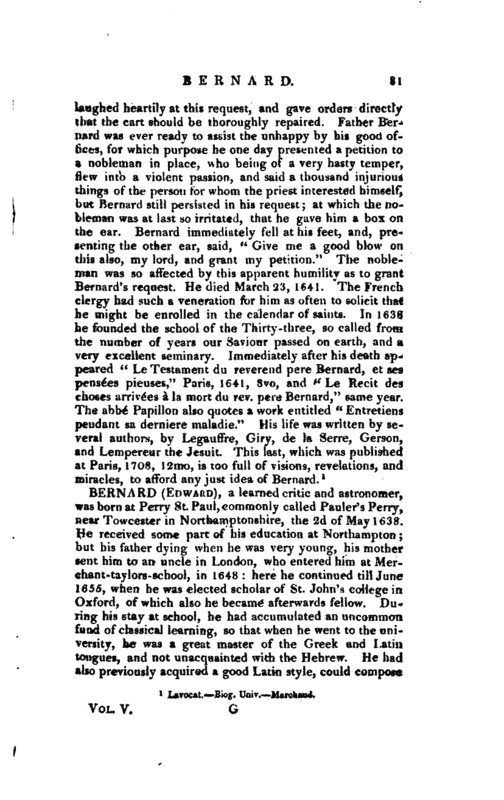 These things occasioning a contest between Mr. Bernard and the curators of the Oxford press, the printing of it was interrupted and at last the purpose of having it done at the expence of the university, was defeated by the death of bishop Fell. 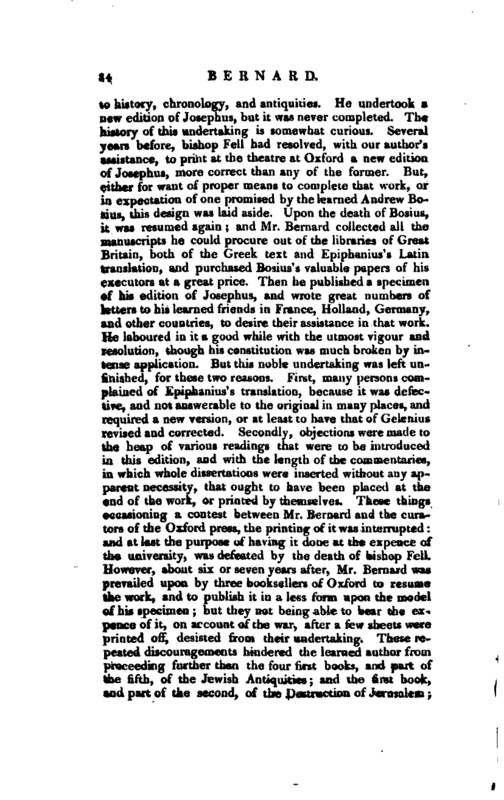 However, about six or seven years after, Mr. Bernard was prevailed upon by three booksellers of Oxford to resume the work, and to publish it in a less form upon the model of his specimen but they not being able to bear the expence of it, on account of the war, after a few sheets were printed off, desisted from their undertaking. These repeated discouragements hindered the learned author from proceeding further than the four first books, and part of the fifth, of the Jewish Antiquities and the first book, tmd part of the second, of the Destruction of Jerusalem; | which were printed at the Theatre at Oxford in 1686 and 1687, and published in 1700, fol. In the notes, the learned author shews himself an universal scholar and discerning critic and appears to have been master of most of the Oriental learning- and languages. These notes have been incorporated into Havercamp’s edition. Biog. Brit. from his Life by Dr. Thomas Smith, published with bishop Huntington’s Letters, 8vo. 1704.